Kat and Karl : the perfect tailgate spot! 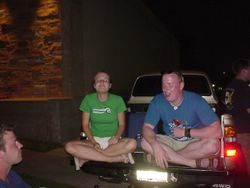 meredith soon-to-be dill and marc tailgating the night away. i think the game might have been in overtime. where were we? in our PERFECT tailgate spot holding down the fort! 2. We have officially tail-gated in the same spot for two years now. IT IS OURS! Our tailgating neighbors with the HUGE GRILL (randy and jason) offered us usage of said grill for next year if we provide our own food. FABULOUS! 3. Next year we will need more TENTS!